After long break I got back to watch repairing hobby. My object - Venus 170, sitting too long in my drawer. After assembling the movement issue manifested. 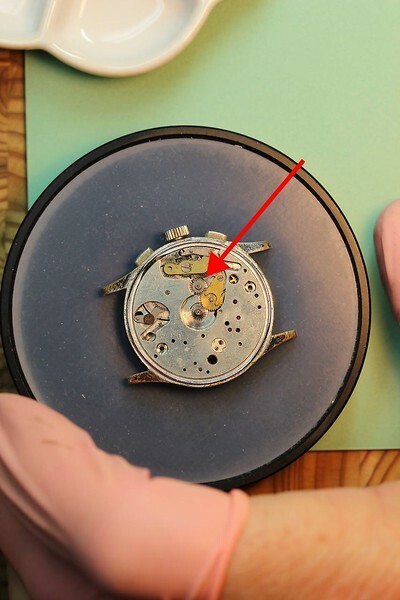 Chronograph function works properly but the movement is not transferred to minute and hour hands. Something tells me that there is a simple solution to this but I can't figure it out. I'm guessing it has to do with the cannon pinion but lack of experience and education prevents me from understanding the issue. The canon pinion could be the problem. The point is that this part is the "clutch" between the wheel train of the movement and the gears for the hour and minute hands. Remove the canon pinion from the centre wheel. Have a good look to the canon pinion. The location where the "barrel" of this part has the narrowest location you see two places (one on each side) where you find a small "grove". Please, have a look with your eye glass. If you found this, please, come back to me. From that moment on I explain you what to do with it. OK? You're so unhip it's amazing your bum doesn't fall off! Thank you for prompt response. I will have a closer look at the watch this weekend. Will report back on my findings. OK Bart, we look forward to you. Machiel. It is, as others said, likely a cannon pinion issue. The Venus 170 uses an offfset cannon pinion design. It is different from a central cannon pinion. It commonly has issues and can be difficult for beginners to tighten. Traditional cannon pinion tightening tools will not work on this cannon pinion as it is very short and not as flexible as regular ones. The cap also breaks off easily if you try to use a traditional cannon pinion tightening tool. After years of working on these, the most successful method I have found to tighten these is a dulled utility knife blade (one in a scraper shape like heat painters use, not pointed) mounted in a table vise. Use a needle in a pin vise to support and hold the cannon pinion over the dulled blade. Place rodico on the end of the needle to help prevent the cannon pinion from flying away. Place a thin scrap screwdriver such as bergeon orange .50 plate on top of the cannon pinion and give it a few very light taps with a very light hammer. If you make it too tight, use a broach to open it back up. If you break it, ofrei still has these but note that a new cannon pinion will still be loose on your existing wheel as the wear is on the wheel pivot not just in the cannon pinion. So you will need to tighten even a new cannon pinion unless you change both the wheel and cannon pinion together. Unfortunately both seem to not be available together anymore. Years ago the manufacturer sold and catalogued them as one part so that tightening wasn't an issue. Thanks for your fantastic explanation. But, I never realised that the VENUS 170 had a canon pinion construction the way you explained. I shall give it try to check. OK. Took the canon pinion off. My first impression was it came off "too easy" as if it was indeed loose. Before that, when adjusting the watch hands is was also as if there was minimal to no resistance comparing to other watches. If anything goes wrong I will just try to get some scrap movement from ebay. I have a photo of the part below, with some markings to help me understand what should I do. Which point should I place the knife blade to "notch" the pinion? That's not the offset cannon pinion. Get the Venus 170 Service guide and see the pictures. The offset cannon pinion has a cap/top on it. See my other post. Don't do anything to the wheel you are showing, it is not meant to be tight. Study the dial side, the friction is not in the center. Between B and C, where the diameter of the canon pinion is minimal, you find, on both sides of the tube, a small "grove". This is the location there you have to focus on. Some people use a "wire cutter", (but there are many who are not right for the job) to bring both sides a little bit more to the inside of the tube. Yes, you can do it with a knife. Support the cannon pinion on a wooden block and give with a hammer a little hit on the knife. Do this on both sides. If you replace the canon pinion, please, put some grease inside the canon pinion. Success, Machiel. The correct cannon pinion part is pictured below pre-service on an example watch I overhauled. 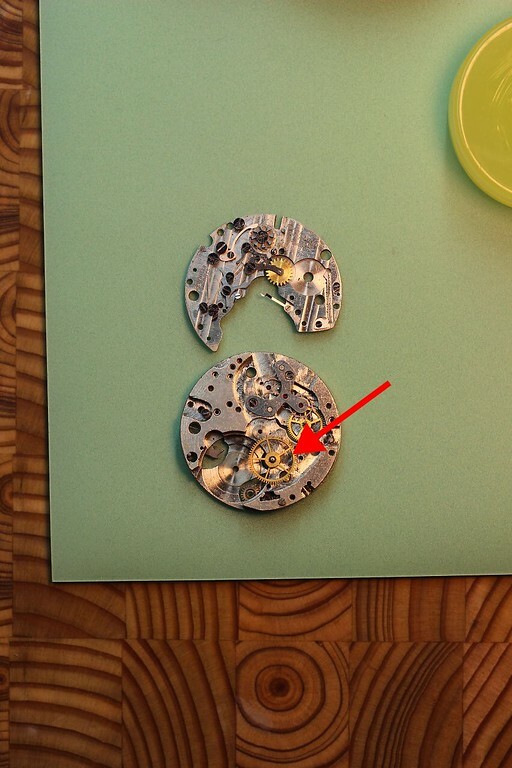 It is NOT in the center of the dial. The cannon pinion friction is located at the offset location. Well that is, if you are right complete new to me. Are you 100% sure that this wheel is fixed on one of the wheels of the wheel train? I've serviced many of these, all of which had lots of wear. It was a distinctive aspect of the movement back the day but has since been used on some other watches often to the dismay of a watchmaker seeking to use his standard cannon pinion tools. In conclusion it's an offset cannon pinion design with friction in the offset cannon pinion. You can see reference to the offset cannon pinion in the Venus 170 Service guide and in some discussions on the web. Ranfft references use of Ed Heuers patent and use of the swivel pinion as well. The whole setting works is unusual. My experience working with this movement has revealed a number of quirks, this offset cannon pinion being a major one. Most of the Venus 170's I have serviced require a good deal of work due to wear and remnants of past watchmaker struggles but once corrected, fully serviced, restored, and adjusted can run quite well. Some additional information. 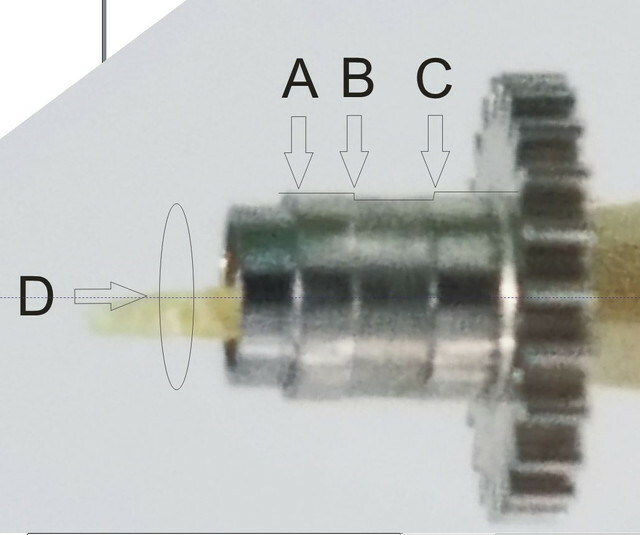 See below, the wheel onto which the offset cannon pinion is installed with friction is shown with a red arrow. THANKS for showing. You see it's never too late to learn something. ...and I messed up. I inserted a broach into the pinion during the operation hoping to achieve enough support. Concept was all right but it wasn't fitting snugly. Also, obviously applied too much pressure and as a result bent the "barrel" part into oval shape. Anyway, thank you all for your support and advice. Till next time! What a shame......... Well, I am sure you can find a lot on EBay or maybe the TZ shop can help you. Previous Topic: Old Billodes pocket watch - 1887?